PHOENIX – Imagine tens of thousands of people gathering at a park in the heart of Phoenix for a three-day, multi-stage music festival along the likes of the Bonnaroo Music and Arts Festival and Outside Lands Music Festival. Event organizers and city officials plan to do just that with the Lost Lake Festival at Steele Indian School Park, which they announced earlier this month. They touted the event as one that will not only heighten the city’s reputation as a top destination, but serve as an economic driver as well. Superfly, the minds behind Bonnaroo and Outside Lands, said they chose Phoenix as their next festival destination because of they were “inspired by the energy and creative shift” happening in the area, according a news release. Superfly’s other music festivals tend to draw large crowds. 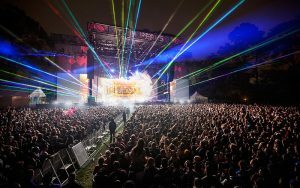 Outside Lands in San Francisco had between 40,000 and 60,000 attendees per day during its inaugural year in 2008, according to research compiled by the city of Phoenix. By 2014, attendance increased to nearly 200,000 with an economic impact of about $60 million. That figure increased to $80 million by 2015. San Francisco collected 11 percent of the festival’s gross sales, which meant $2 million for the parks department’s coffers, according to the research. “These things typically impact a community in the tens of millions of dollars … and the other thing that’s really interesting about them is they’re every year,” Superfly co-founder Rick Farman said. Roxann Favors, administrator of the city’s major special events, said the Valley has seen an increase in these types of larger events. She said the city has worked with Superfly for about two years on the concept, and she believes Phoenix deserves its own “iconic” music festival. She said the city did not provide special incentives to host the festival, and Lost Lakes must still pay park rental and permitting fees. But the city will provide public safety officers along with traffic and pedestrian control. She did not provide cost estimates. Phoenix Mayor Greg Stanton called the festival a great opportunity for the Valley, but some neighbors were hesitant. On Facebook, Rachel Tullio wrote that she hoped organizers would reach out to neighbors, consider parking and traffic problems, and help with cleaning the area after the event. “Fourth of July at the park always leaves our area a hot mess, I can only imagine this will be even bigger and messier,” she wrote. Lost Lake representatives said they were working with city officials to mitigate the festival’s impact. Favors said they plan to do extensive community outreach with residents and businesses. Stanton suggested attendees use the light rail to ease traffic concerns. Some residents expressed skepticism about that as well. The festival will feature more than 40 artists ranging from “iconic” to of-the-moment national talent, along with local acts, organizers said. It also will focus on local cuisine. Organizers plan to announce the lineup in the upcoming months. It’s scheduled for Oct. 20-22.